Entry is completely free for this historical collection. You don’t need to buy any tickets for it. Note: There are a Cafe, Restaurant and Gift Shop available inside the museum premises. All these services are paid. 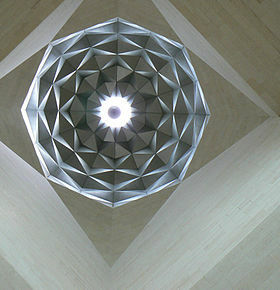 Pritzker Architecture Prize winner architect I.M.Pei has designed this simple awesome architecture. Surrounded by water this building now becomes the icon of the Doha city. This 5 storied building spread over 45000 square meters of area. A well-known Turkish construction company “Baytur Construction” has done construction of this building in the year 2006-2007. The big name in the interior designing “Wilmotte Associates” had designed the interior spaces. This iconic architecture consists of a big main dome, five doors and central tower. A huge size metallic chandelier present inside the building attracts you towards them. There are many facilities are available for visitors which includes 200 seat theater, library, cafe, restaurants etc. You can also enjoy the panoramic view of the Persian Gulf from this building. A lush green park which is adjacent to the museum is another attraction in this area. This park is known as MIA park and it is the hub for cultural activities. MIA park has occupied the area of 290,000 square meters. In park premises, you will get the facilities like cycling & walking tracks, cafes, boats on rent, a carousel etc. Just because of its architectural design and look it is also called as “Modern Islamic Museum“. This modern Islamic museum hosts thousands of things like various historic documents, woodwork, textiles stones with inscriptions, ceramics etc. All these things have collected from three continents. It represents the 1400 years history and cultural heritage of Islam. It is the worth-watching place for Islam followers and lovers. Visit Duration: It takes 3-4 hours to visit this place. Facilities: Prayer Room, Free Wi-Fi, Arabic and English languages audio guide is available, 40 minutes guided tour in Arabic and English languages, Free guided tour on Wednesday and Thursday etc. facilities are available for visitors. Note: Dress modesty should be maintained. How to reach Museum Of Islamic Art Doha? By Road: This iconic building is easily accessible by public and private transport. Nearest Bus Stop: Museum bus stop is the nearest bus stop and it is located around 1.5 km from the museum.